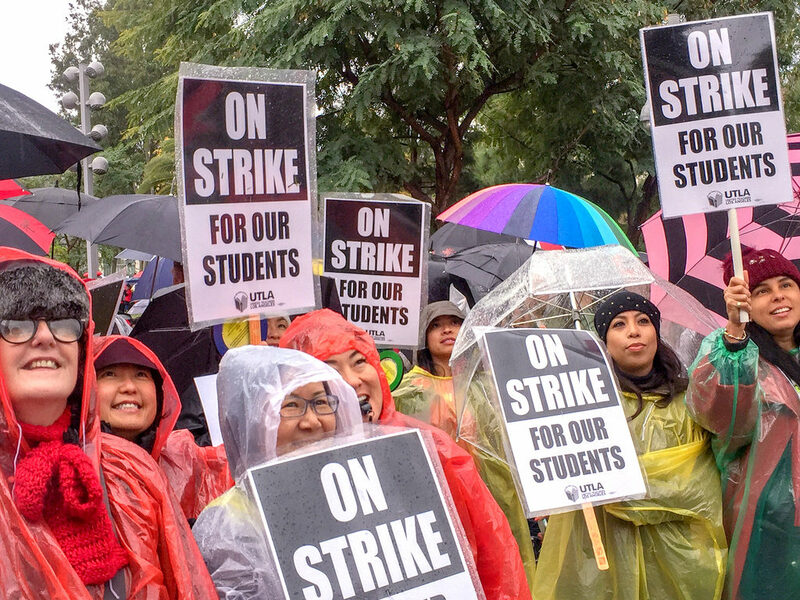 Janine Jackson interviewed Kent Wong about the Los Angeles teachers strike (since settled) for the January 18, 2019, episode of CounterSpin. This is a lightly edited transcript. Janine Jackson: As we record on January 16, the strike by more than 30,000 Los Angeles teachers is entering its third day. The decision to go on strike is never a whimsical one; the union, United Teachers Los Angeles, hasn’t had a strike in nearly 30 years. Here to help us see what’s behind this momentous collective action by LA educators is Kent Wong, director of the UCLA Labor Center and vice president, currently, of the California Federation of Teachers. He joins us by phone from Los Angeles. Welcome to CounterSpin, Kent Wong. Kent Wong: Thanks very much. JJ: Strikes generally involve multiple issues of various scales, but they have to be enough, taken together, to push people to do something that involves tremendous uncertainty, and that, some media suggestions to the contrary, organizers are never eager to do. What should we understand about what has motivated some 98 percent of the union to authorize this strike? KW: What is remarkable about the Los Angeles teacher strike is that the main issue is not wages. The fact that 98 percent of the teachers of Los Angeles voted to authorize this strike reflects a deep discontent in the direction of public education here in Los Angeles, but indeed throughout the country. California public schools used to be No. 1 in per-pupil funding in the country. Now they’re down there about 43rd or 44th, and they rank 48th in the nation with regard to class size. We have watched, since the passage of Proposition 13 back in 1978, the steady erosion of financing for the public schools, and a massive transfer of wealth from the public sector to some of the wealthiest corporate landowners in the state of California. The second big issue is that there has been a hemorrhaging of resources from the public schools by the corporate-backed, for-profit education system, and the network of charter schools that has developed throughout Los Angeles. And during the last school board election, corporate-backed candidates swept the majority, now, on the school board, who support the continued privatization of public schools. JJ: Well, this is the bigger picture, and I want to go back to that. But when you just read coverage, you hear, “It’s about class size. The union says they want class sizes to be smaller,” which you noted. But then they say, “Well, the district says they just don’t have the money for that. The money just doesn’t exist to do that.” That’s kind of the granular issue that one sees in media coverage, with then perhaps some allusion to this bigger-picture question about visions. But if I could ask you, how are we to interpret the sort of day-to-day coverage that says, “It’s about the fact that the unions want funding that just doesn’t exist”? KW: California is the fifth-largest economy in the world. The reality is that there is a $2 billion reserve within the LA Unified School District, currently, and the superintendent that was hired by the charter-backed majority on the school board is a hedge fund multi-millionaire who knows nothing about public education. So this is really a question of a fight for quality public education, and a pushback against corporate-dominated policies which are calling for the transference of wealth from the public sector to the for-profit private education world, where there are no regulations, where corporations are making money off the education of our children. I would note what Leonie Haimson wrote in the Washington Post, which recently had an op-ed by former Education Secretary Arne Duncan, who opposed the LA teacher strike—you know, his kids aren’t in aren’t in schools with classes the size of the classes on average in Los Angeles. So a lot of these folks who are critical of public education, their kids are not in these schools, and it matters. Alia Wong wrote a piece in the Atlantic, where she was interviewing striking workers, many of them Latino, in Los Angeles, and they weren’t even talking about [Superintendent Austin] Beutner, some of them weren’t even talking about charters. They were really just talking about how they want something better for the kids that they teach. KW: Absolutely. And in Los Angeles, as in major cities throughout the country, there are major class and racial divides. Seventy percent of the children in public schools of Los Angeles are Latino, and there are large numbers of Asian and African-American students as well in the public schools. And increasingly, we see a situation where those with financial resources are choosing to put their children in private schools. So we have a public disinvestment policy, with regard to public schools, that is being led by corporate America, but that has certain support from those that have wealth and privilege in this country, who can pay for other alternatives. So this is really a broader issue of civil and human rights. In the fifth-largest economy in the world, it is a disgrace that our public schools are so poorly funded, and it has a disproportionate impact on low-income children and their families and students of color. JJ: Right. And so coverage that sort of presents it as “teachers versus students,” I find just so invidious and so harmful when, when you talk to these teachers, they’re thinking of their students first. KW: Absolutely. 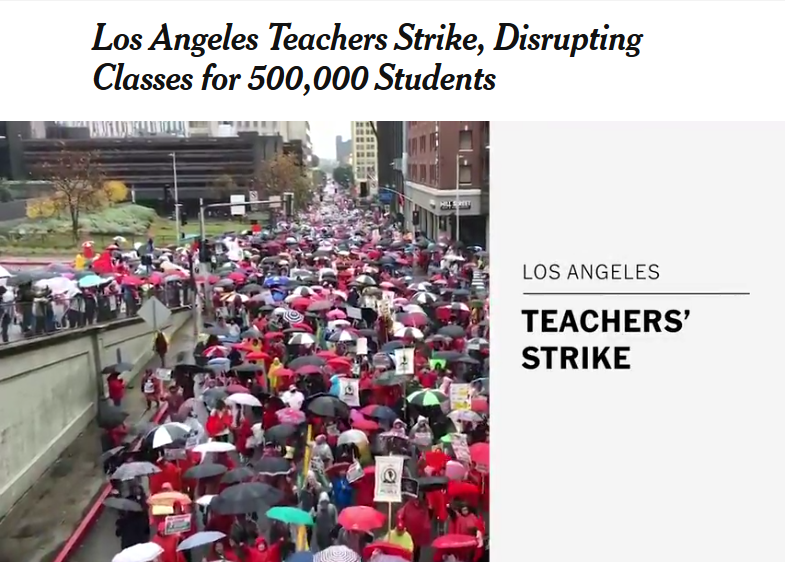 The public support for the teachers of Los Angeles has been remarkable. The teachers have really emerged as heroes within this fight. They are challenging the status quo. They are fighting for a future for their children. These are teachers who are used to using their own money to pay for basic supplies and basic needs in the classroom. These are teachers who work many hours after the classroom, in order to provide the support needed for their children, and they’re putting up the good fight. And what’s been very gratifying is to watch the broad public support that our teachers are enjoying right here in Los Angeles. 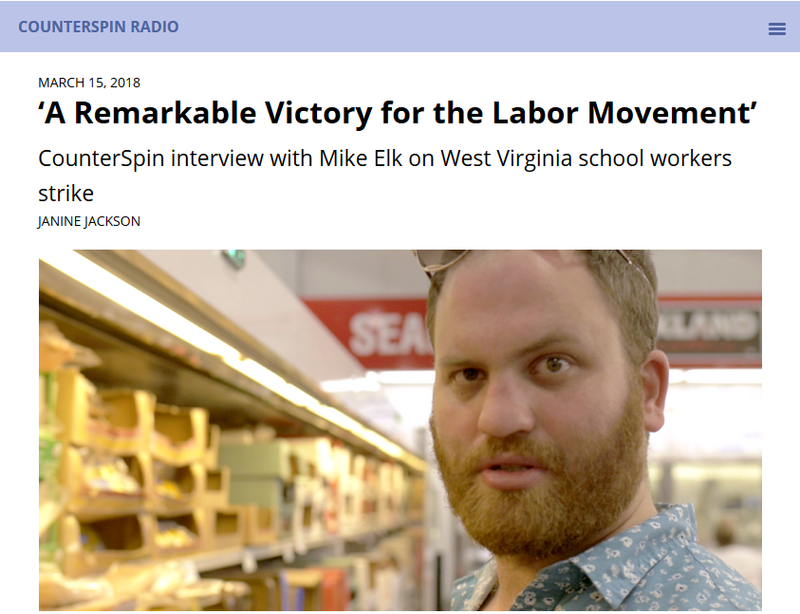 JJ: I spoke with labor reporter Mike Elk of Payday Report many months ago, talking about the teachers strike in West Virginia. And he was saying that we hear a lot about how unions are going under, and they don’t have any meaning in the society anymore, but that in the South, for example, you have unions that don’t have collective bargaining rights, they’re even in right-to-work states, and they’re still winning victories. I’ve heard you also say that a drop-off in unionization per se doesn’t necessarily mean that workers aren’t organized. But what’s happening in LA disputes that negativity in a number of ways, doesn’t it? KW: What is very dramatic is that the United Teachers Los Angeles is affiliated with the largest union in the country, the National Education Association, as well as the American Federation of Teachers, one of the largest unions in the country. And the largest single group of organized workers in the country today are teachers. So the fact that we have such amazing solidarity among the teachers here in Los Angeles is a really powerful statement about the relevance and importance of unions in the fight, not only for the rights of workers, but in the broader fight for quality public education. JJ: And their ability to build partnerships with the community is what, when it comes that you have to go on a strike, that’s how you can have a community supporting you in that action. KW: The fact that 500,000 children are impacted by this strike—and the fact that the parents and the community at large are standing with the teachers—is really a wake-up call, in terms of what we need to do collectively to demand quality public education. 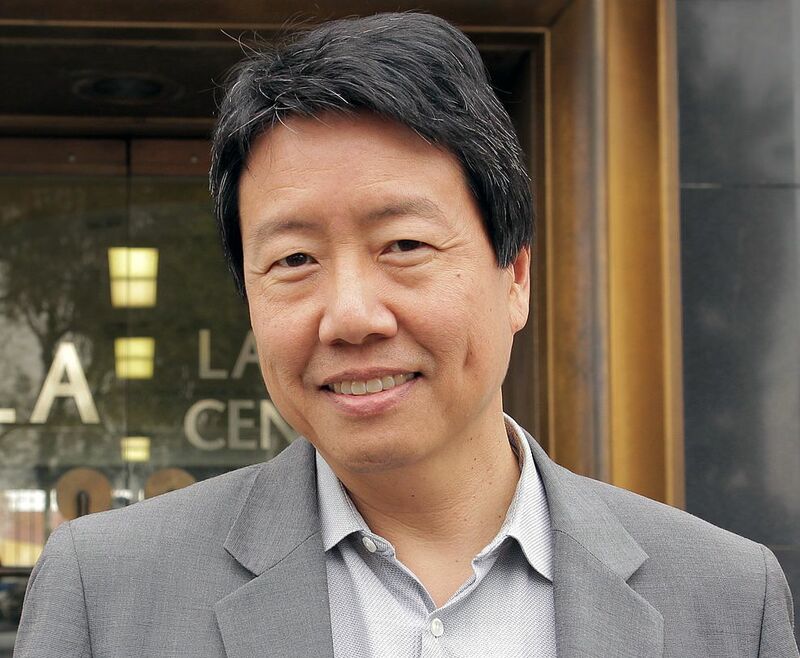 JJ: We’ve been speaking with Kent Wong, director of the UCLA Labor Center and currently vice president of the California Federation of Teachers. Kent Wong, thank you so much for joining us this week on CounterSpin.